An unanticipated need to send the JOIDES Resolution survey camera platform down along the drilling pipe at our second study site near the north island of New Zealand turned into a pleasant surprise for me. Once again, I would have video imagery collected to explore upon the cameras’ return! At this site we drilled in much deeper waters than our first site – approximately 2,650 metres deep. That’s almost 4 times as deep as our first site! And that’s what made watching the new set of videos even more interesting. 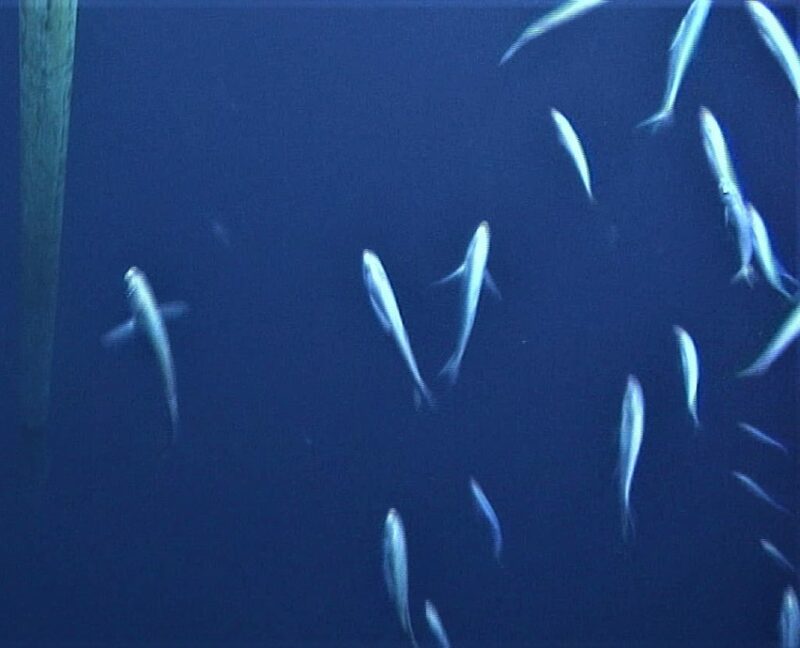 With different water depths come different abundances and diversity of animals, and one can thus automatically expect having the opportunity to observe different things. So, what was seen at our second site?…. 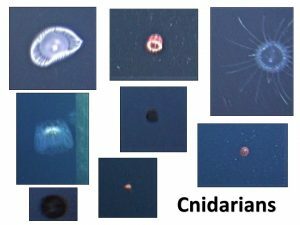 Many different species of jellyfish (i.e., Cnidarians), both big and small, with long tentacles and without. Jellyfish are one of my favourite ocean creatures because of their beauty, grace, and interesting variety of colours, shapes, and sizes. 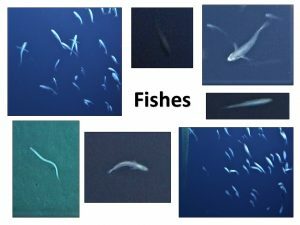 Several Colonial Salps were also seen, but not in the quantity or of the extreme length as was observed at our first, shallower study site. 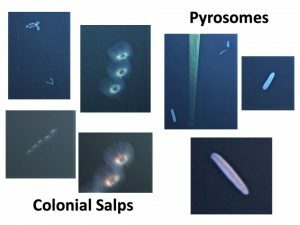 Pyrosomes (otherwise known as “sea pickles”) were also seen. 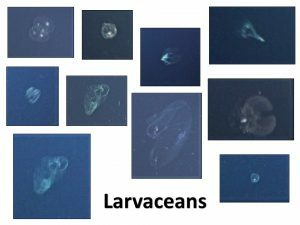 Larvaceans, with their lovely and intricate gelatinous “houses”, were very abundant. Many different shapes and sizes were observed. 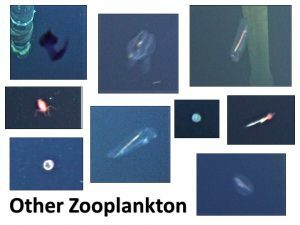 As always, a myriad of diverse other kinds of zooplankton (i.e., animals that float through the water column) were found, including a few Ctenophora “comb jellies”. And, as per usual, we saw fish! While fish weren’t seen frequently throughout the video, we did have the occasional visitor hang out around the drilling pipe and camera. We did have an entire school of fish swimming about at one point as well! Stephanie Sharuga has a Ph.D. in Oceanography and Coastal Sciences from Louisiana State University in the United States of America, where she studied and developed approaches for using submersibles for evaluating deep-sea benthic megafaunal communities in the northern Gulf of Mexico after the Deepwater Horizon oil spill. Stephanie also holds a M.S. in Environmental Management and Sustainability from Illinois Institute of Technology, and B.Sc. in Biology and Earth & Ocean Sciences from the University of Victoria in Canada. Over the years, she has been involved in a variety of research, volunteer, and consulting projects, including with organizations such as the Bamfield Marine Sciences Centre, Smithsonian Environmental Research Center, Field Museum, and the International Ocean Discovery Program. Her past research has included projects that combine the studies of marine communities and seafloor geology, along with work in marine policy and environmental management. She has also been actively involved as both a ship and shore-based scientist for multiple oceanographic cruises over the years. Stephanie shares her lifelong passion for the ocean, environment, and science through a diverse variety of science education, outreach, and STEM mentoring activities.